I had lunch with two coworkes in the Indian cuisine shop. I ate a smorgasbord, vegetable and beans curry, nan, salad, and more. Vegetable curry was so spicy!! and delicious. There were few regular employee today. It was calm and carefree in the office. The weather was pleasant today. I had lunch at the cafe with a coworker, after that we sitted in the sunshine in the park different from always. 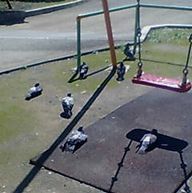 This picture is pideons in that park. There were lied in the sunshine too. I was very sleepy, but I polished my nails at night. God! I made a mistake that and tried once more. I've been able to do well. "Failure is a stepping-stone to success"
Today was a frustrating day too. because I've gotten irritated very much for my mother from yesterday. Then I went out for a change. I bought a Japanese-English dictionary and I saw many cats and dogs on my way home. I felt better very much. I was very very exhausted today. But I became energetic when shopping. I got a beautiful green hair accsesory and nail seal. Today was kind of fun.